Nothing is permanent, except death! You have a sweetheart at the moment, and you don't love her or him passionately, the fire of love might disappear and fade gradually. You have a spouse whom you think is the ideal partner. But if you are not prepared to understand what is life and family, misunderstanding and obstacles along the way, could sometime break a wonderful marriage. Divorce and separation are quite common. Soul mates are considered as most lovable partners but life has no mercy in the face of temptation and evil over the world. The changes of emotion and environment, even soul mates could become hate mates. The only time when one claims that she/him is your sweetheart forever, or a spouse till death or to be a soul mate infinitely...is when her or his name is being engraved onto a tombstone. Death is permanent. As such, it confirms the name engraved has been a true lover who has loved you till the end. I hope and wish... my love for my little darling is an ever lasting one. See the above picture and you will laugh over my thought. 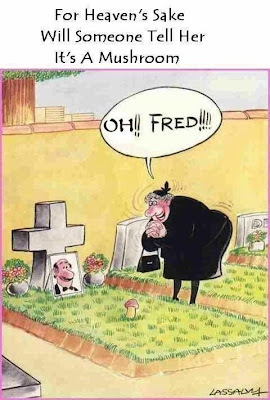 Fred was definitely a true lover.